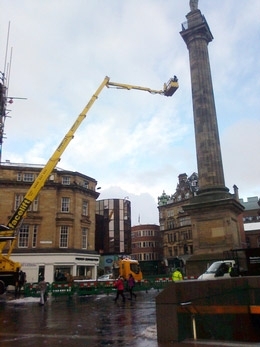 This time 5 years ago, the Facelift team sprang into action to help one of Newcastle’s best-loved monuments try out a whole new look. We worked with Citizens’ Advice Bureau to dress the city’s Earl Grey monument in a 40ft knitted scarf to help encourage people to stay warm and ensure they claim for any relevant benefits. The scarf, in CAB’s brand colours of blue and yellow was hand-knitting by a volunteer from a local wool shop. It was made up from over a quarter of a million individual stitches, in 3000 rows.